Struggling to keep up with all the chores and get a full 3 hours of sleep every night between feedings? Start shopping online! We started using Peapod and reaped these Stuntastic benefits. 1. Shop in your underwear. While the little ones are napping, at school or playing in the backyard, you can get the weeks grocery shopping checked off the to do list. Even better, get the iPhone app and shop while you ride the train to work. Extra points if you do it in your underwear. 2. Get a weeks worth of groceries in 5 minutes with lists. Peapod lets you store lists that make loading up your virtual shopping cart as easy as clicking a button! I got lists. I got "Friends coming over", "Dinner for the In-laws", "Wife taking kids to her sister for the weekend" (aka, pizza and beer), and "Flat broke". With a single click everything I need for the week pops up and I can select quantities, click buy and be DONE. 3. Sort by price, sales or size to make finding what you want quick and easy. I like sorting by the unit price to get a true comparison. 4. No chasing your little ones throughout the store and watching them tip a tower of jelly in aisle 6. Use your spare time to take them to the playground to get out that excess energy. 6. Free bubbles. Our usual driver brings stickers and bubbles for the kids and has become a part of the family. He's awesome. He brings food. Saves time. And even has tips on how to cook the pork chops. Still hoping he will take it to the next level and cook it too! All in all, using Peapod saves time and gives you more time for your family. We've been happy with the produce and it doesn't cost as much as you think. We even did a price comparison test. 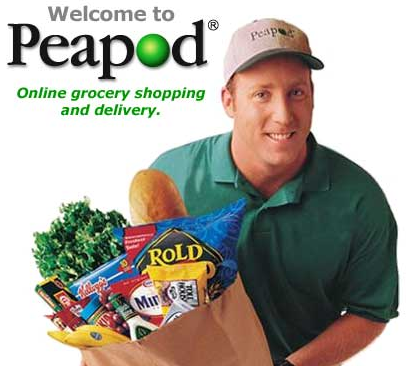 We took a Peapod receipt and went to our local store. While many items differed in price the overall bill including delivery fee came within 10 bucks of the local stores total. Not bad for shaving a few hours off the weekly chores and not having to take the little one down the cereal isle. Since you recommended Peapod I haven't been back to the grocery store yet...unless you count Whole Foods but that's more for browsing fun and getting the really hard to find stuff. It saves so much time and is much less stressfull than taking a toddler to the grocery store. Thanks for the tip on Peapod!! So glad the tip helped! Now if only the fridge could place the order for us.